Pezzuco Construction completed the total rehab of a 15-story high-rise, including the exterior and interior finishes, windows, flooring, painting, kitchens and exterior site work. 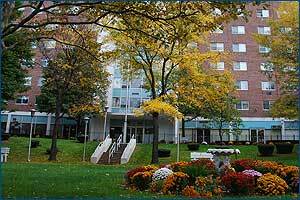 New and improved apartments were provided for the residents of the building. We were able to negotiate a price that fit the owner’s budget, without sacrificing style or atmosphere. General contracting of all trades and carpentry were provided. We were able to install new kitchens and windows while the building was still occupied by the current tenants.